The most basic form of a snow crystal is a hexagonal prism… we can make that shape with Magna-Tiles! It is at the center of our Magna-Tiles Snowflake pictured. This pattern was made with Magna-Tiles Clear Colors on a light table! The snowflake design is made up of 36 equilateral triangles and columns of 2 vertically standing small squares lining the perimeter. Cool! Compare the Top View and Side View! Notice all of the triangular prisms, balanced triangles, and beautiful symmetrical design. It looks like the most inner pattern is a hexagon made of six equilateral triangles. Cool! Top View. Impressive design and Magna-Tiles building! Side View. We spy a Hexagonal Pyramid! Do you see it? Top View. Symmetry is pretty! 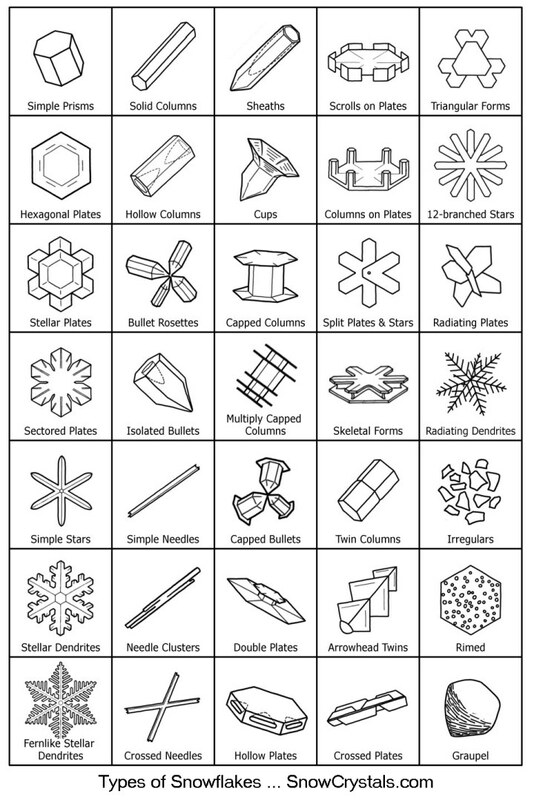 In real life, there are many types of snowflakes! It is not easy to classify snowflakes because there is no one precise way to define them. Below is a table with the more common and/or distinctive types. Visit here to learn all about snowflakes! They have beautiful shapes and patterns! This entry was posted in Magna-Tiles Creations and tagged Hexagonal Prism, Snowflake, Symmetry, Winter. Bookmark the permalink.